At least 20,000 Americans are treated for carbon monoxide poisoning (CO poisoning) each year in the U.S., the Centers for Disease Control and Prevention (CDC) have revealed. And while certain people may be more susceptible to CO poisoning, everyone’s risk of this injury increases in the wintertime, especially for those who live in colder areas of the nation. The primary reasons for this are that, during the winter, far more people use fuel- or wood-burning appliances for heat and that CO is produced anytime something is burned (because it is a product of combustion). Because CO cannot be detected by the human senses, it has the potential to silently and invisibly harm people, depleting their bodies’ of oxygen and damaging their tissues. Untreated, CO poisoning can result in a loss of consciousness, tissue necrosis and even death. If you don’t have a CO detector on every level of your home (including in basements), install detectors where needed to make sure each level is monitored for the presence of CO. Replace the batteries in your CO detectors if you haven’t already done within the past 12 months. Never burn items in appliances or spaces that are not directly vented to the outside. 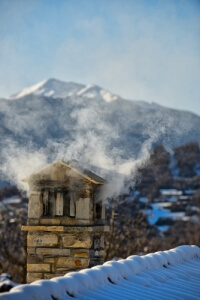 Before burning anything in a fireplace, be sure the flue is clear and open. Get the major appliances in your home serviced annually, preferably before winter. These appliances can include ovens, washer/dryer systems and HVAC systems. Aging and faulty equipment can be a source of CO gas leaks, and this type of maintenance can identify these leaks before they cause serious harm. Warm up vehicles outside of garages or enclosed spaces to prevent the accumulation of CO gas. Periodically look for signs that CO may not be venting properly to the outside. Signs can include soot build ups at the bottom of fireplaces, rusting flues, and discolored chimney bricks. Familiarize yourself with the symptoms of CO poisoning, and be ready to seek emergency medical attention if you or anyone you love starts experiencing these symptoms. Contact an Experienced Denver Personal Injury Lawyer at Bell & Pollock, P.C. If you have suffered carbon monoxide poisoning – or if you have been harmed by any type of negligence, you can turn to a Denver personal injury lawyer at Bell & Pollock, P.C. for experienced help advocating your rights and pursuing justice.